Decorating Like a Pro for the Holidays! Is it just me? Why does it always seem that time runs the speed of light when it comes to December? There are so many things to do in a small amount of time; but you can still make your home dazzling for the holidays this year. 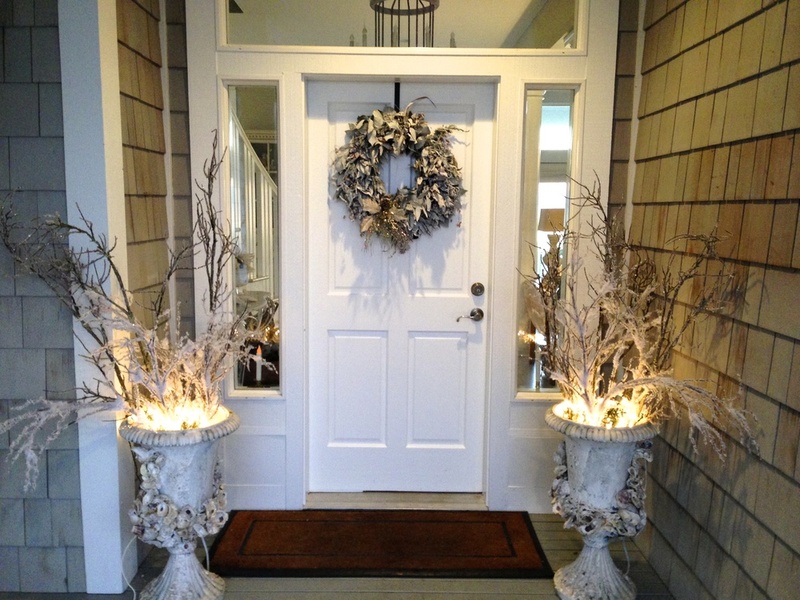 Let me share some of my best decorating tips with you for stunning holiday décor. Most of us have several lists of things that need to be done before Christmas and the New Year arrives. For instance, decking the halls, parties to plan, guests arriving, family dinners, shopping for the traditional gift giving, and, of course, Santa. Plan, organize, and (above all) have one designated holiday calendar. Combining all your lists together on a specific calendar will help make all those holiday activities manageable. Having an overall picture of everything in one place allows you to plan and pace yourself. There are no sudden surprises and getting a little done every day will make for a less hectic frazzled you. Deciding on a theme right from the beginning will make everything easier and more cohesive. (This creates a pulled-together look as if you planned this for months.) Accentuate your home’s best architectural features (crown molding, fireplace, windows, etc.) with garland, lights, and scenic tablescape. You’ll be surprised how decorating a few key focal points make such a striking impression. I love silver, white and an accent color. Go elegant or casual with a silver and white theme. White lights illuminate branches in the garden urns. Getting your tree/trees up and decorated will put you in the holiday spirit. If your family is steeped in holiday traditions (and decorating your tree is part of that), a theme still works nicely into those traditions, as well as the décor. Rushed for time? Having your tree delivered will save a whole afternoon. But if part of your family Christmas tradition is finding that perfect tree, then carve a date out early on your holiday calendar for this festive tradition. What do we do? Pull the tree out of the box and plug it in. It lacks the romanticism and beautiful pine scent... but its goes up quickly and I can have lights turned on in a few minutes the day after Thanksgiving. My boys love to put the ornaments on while I decorate other areas of the living room. Turn on your favorite Christmas movie or music. I usually add some real wreaths or garland to make up for the artificial tree. Silver, White and Blue Ornaments. 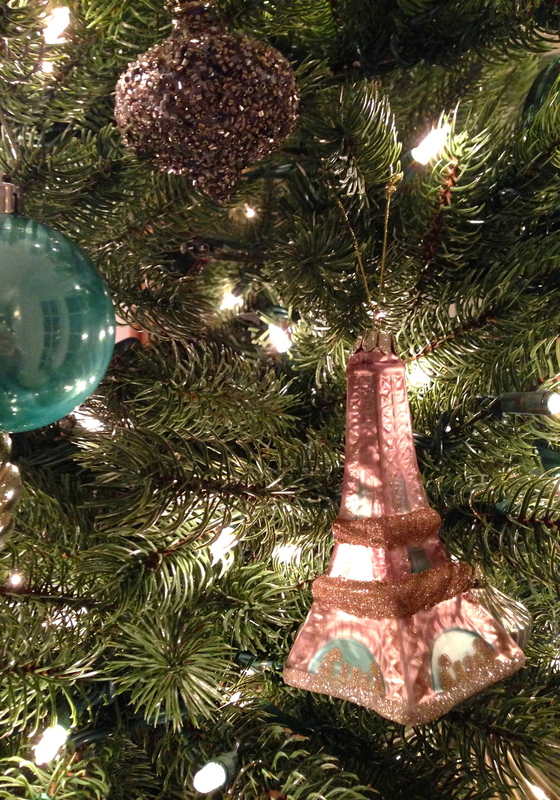 Glass Eiffel Tour ornaments remind of past trips to Paris. I know what your thinking... why is this next tree in this blog? For some reason, I love this multi color monkey tree and bright colors on a white Christmas tree. The point is, Christmas themes are personal preference and there is really no right or wrong. 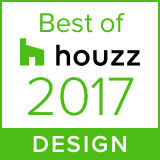 Kudos to Toby Fairley Interior Design for being bold. 2. Mantles, Cabinets and Shelves. Adding garland and decorations to fireplace mantles, cabinets and shelving is one of my favorite ways to make the house pop. I use garland in some areas and others, just lights. The mantle below is my mothers. She decorated the mantle with an angel statue, lights and antique Christmas postcards from around the world. As you can see, she likes Paris as well. 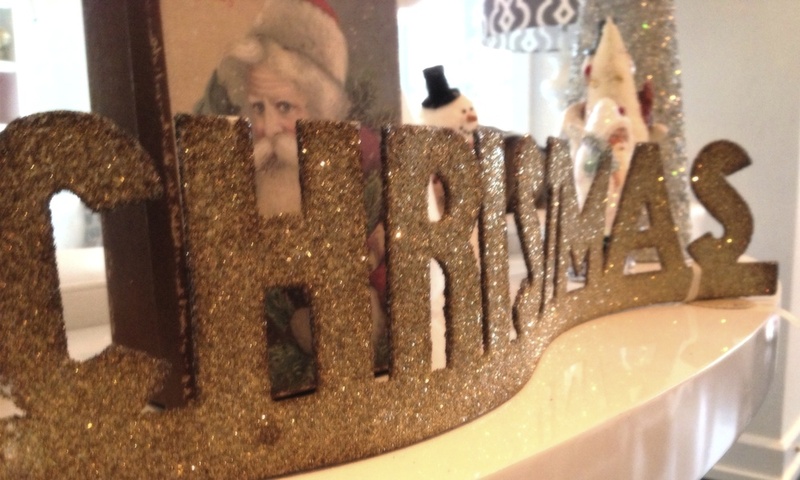 This garland is on the shelf over my TV cabinet. Lights, garland, vintage style mercury glass and white deer evoke a vintage look. Preparing the perfect tablescape is one on my favorite things to do during the holidays. It allows my creativity and personality to run with unlimited possibilities. Christmas ribbon, giant pine cones and a well place ornament make for a good focal point. The glass urns are great to use all year round. Fill with apples or lemons when not a holiday. They get filled with candy on Halloween. Setting a holiday buffet table for Christmas Day is a must-have at our home. With holiday festivities, buffets are lifesavers as it gives the host time to enjoy her family and friends while guests serve themselves. Perfect for holiday dinner, morning brunch, or cocktail station, buffets make for an inviting setting for holiday drink and fare! Create a beautiful setting that has a cheerful ambience that magically draws guests to eat and visit with each other. 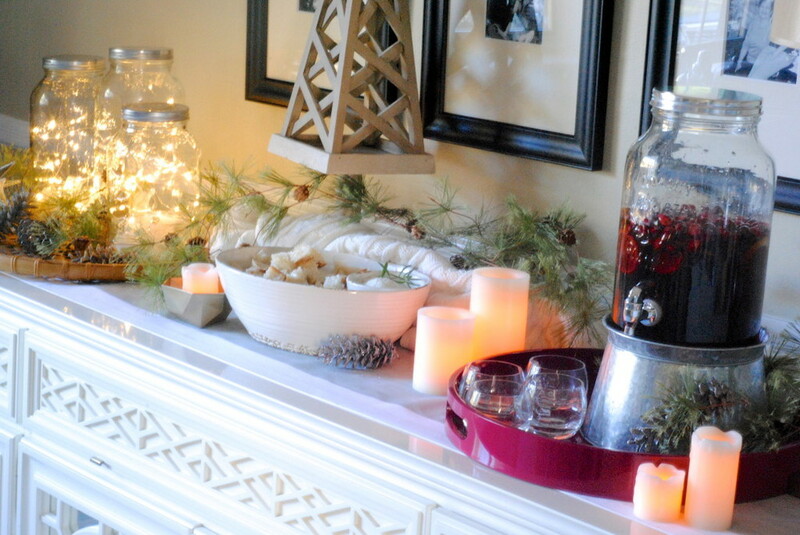 Love this Christmas buffet from makinglemonadeblog.com. Cranberries in glass beverage dispenser bring in the color of the season. One tradition I love is making Christmas cookies or Candy. Usually with my mom or daugher. I love making cutout cookies with a sweet buttery icing. Love this Hot Chocolate Bar on the buffet. Great idea from mysweetsavannah.blogspot.com. Whether you have a formal entrance or a casual hallway staircase entryway, welcome family and guests into a warm inviting space decked with breathtaking décor. Place family traditional mementos in their own place of honor near the entrance. These added special touches bring good memories when intertwined into your family holiday décor. Branches, lights, icicles and greenery adds enchanting sparkle to any theme. Decorated in a upward sweeping direction, carries your eyes from the littlest trinkets to the boldest ornament, allowing your guests to take it all in – in a single glance. This holiday season make your home magically enchanting with spectacular holiday décor and a feel of warm cheer. Remember to decorate early to get the most of the season, use a theme, and if you really get in a crunch, hire someone to decorate the outside of your home with festive décor or have your tree delivered. The holidays are a time of the year for family and friends to gather together to share goodwill and make new memories. Carry the holiday spirit with you throughout the coming year.